An explosion on a minibus in the Turkish Aegean resort of Kusadasi has killed at least five people, including one British and one Irish woman. At least 13 other people were wounded, including five other Britons, three of them seriously. Turkish officials are investigating the possibility that the blast was caused by a parcel bomb. Turkish Prime Minister Recep Tayyip Erdogan called the blast a "terrorist attack" without laying specific blame. "The government will naturally take the necessary measures accordingly," he added. 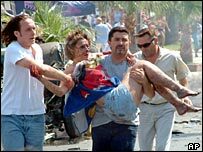 No group has said it carried out the bombing. The British woman died of her injuries after having been taken on to the nearest city, Izmir - 90km (56 miles) away - for medical treatment, along with the other wounded Britons. UK tour operator Thomas Cook has confirmed that two of those killed in the attack and the five injured Britons were their customers. "One guest was travelling with Thomas Cook Tour Operations, and the other with Thomas Cook UK & Ireland's subsidiary company, Sunworld Ireland," company spokeswoman Faith Wooton said of the dead holidaymakers. "Thomas Cook's first priority is the welfare of its customers, and the company's overseas team is on hand to support the injured guests and their families," she added. The British ambassador, Sir Peter Westmacott, is travelling to Izmir and a consular team is going with him to provide support. The BBC's Jonny Dymond in Istanbul says Kurdish militants are the most likely suspects if it was a bombing. Police said evidence was now pointing towards a bombing rather than a suicide attack as earlier reported, said Kusadasi government official Ali Baris. Provincial governor Mustafa Malay earlier said the blast could have been caused by a bomb placed under the seat on the bus. Turkish President Ahmet Necdet Sezer and Irish Prime Minister Bertie Ahern condemned the suspected attack, while UK Foreign Secretary Jack Straw called it a "repugnant act". The blast comes six days after a bombing in the nearby town of Cesme, which left at least 20 people injured. Kurdish militants claimed responsibility for that attack, as well as one in Kusadasi in April, in which one policeman was killed and four other people were wounded. Militants both from the far left and from Islamist circles have carried out bombings in Turkey in the past, as have Kurdish rebels. Saturday's minibus explosion took place at 1030 (0730GMT) as the vehicle was travelling through Kusadasi's Ataturk Square, the semi-official Anatolia news agency reported. 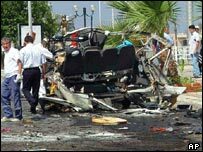 The blast blew the roof off the minibus, a public transport vehicle shuttling people between the town centre and the beach. Kusadasi is popular with both Turkish and foreign holiday-makers. A group called the Kurdish Liberation Hawks (Tak) said it carried out the bombing in Cesme on 10 July. Their overall aim is to force the Turkish government to grant autonomy to the predominantly Kurdish south-east of the country, but the means to that end appears to be to strike at the tourism industry - the life blood of the Turkish economy, our correspondent says. The Tak is an offshoot of the Kurdistan Workers' Party (PKK), which has been fighting the government for independence since 1984. More than 37,000 people have been killed in the 20-year campaign by the PKK, which is considered a terrorist organisation by the US and EU. The rebels declared a unilateral truce in 1999, but ended it in 2004, saying Turkey had not done enough to meet their demands. Have you been affected by the explosion in Kusadasi? Send us your comments. Me and my girlfriend were in Kusadasi last week, on the minibuses (they called them dolmus). My skin went cold when I heard the news. My thoughts go out to the people who have died, and the people who are seriously injured, as well as those who are related in any way to the victims. I would like to take this opportunity to express my sorrow to the people of Kusadasi. I really enjoyed my recent holiday there and send my well wishes to those warm and welcoming inhabitants I met. As a Brit who enjoys living and working in Istanbul I am full of regret that such an event should happen in such a lovely, peaceful part of the world. The bullies who carry out such horrible acts will not deter me from returning to Istanbul, my "second home". Nicola Dellow, England and Turkey! I am going to Olu Deniz today with my family and I have come to be very disturbed by this blast. Although we are on the other side of the Island we can't put this to the back of our mind. I shall keep the families and friends of those dead in my prayers. I am Turk, living in UK. Cesme is in Izmir, where my hometown is, and Kusadasi is very close, which we visit every summer. I was first worried that my relatives were among the injured, thanks god, they were not. These inhumane attacks on innocent civilians are no less barbaric or inhumane than those committed in London; and should be equally condemned. Terror has no particular race, religion or ethnicity. It is inhumane to sympathise with these evil attacks or the motivation behind the attacks on innocent civilians. My Turkish wife's parents live in Kusadasi and we are going there today for a week's holiday. Naturally, we are concerned about the bombing and feel sorrow for those caught up in this dreadful act, but we have agreed that our trip will go ahead as planned. If tourists alter their travel plans to avoid the places targeted by terrorists, which is exactly what these idiots want, then we run the risk of encouraging further terrorism as an alternative to dialogue and discussion. My family is in and around Kusadasi as well as Cesme, site of the other bombing six days ago. I cannot tell you how angry we Turks are at these who have done these deeds. The media in Turkey is already speculating that Kurdish and/or leftist terrorists have done this. Europe needs to wake up and realize a terrorist is a terrorist, yet both Reuters and other news agencies have called these people 'militants' instead. What difference is there between terrorists who kill in the UK and those who kill abroad? The time has come to crack down on all those PKK cells that are allowed to operate freely in the UK, Germany, France, and elsewhere. I'll never forget a shop owner who went out of his way to brew a special cup of Turkish coffee for me during a visit to Kusadasi two years ago. My heart goes out to such warm and hospitable people.